When it is a very cold and wet day baking needs to be done. These biscuits are a version of one of my favourite and versatile dough mixtures. The basic dough is made and then the flavours added. Any type of dried fruit will work, nuts can be used and all types of chocolate and choc chips. 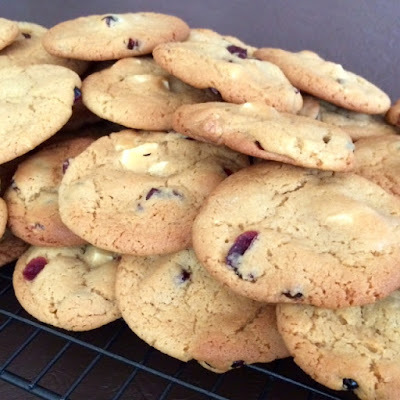 This version is made with chopped squares of white chocolate which give a slightly chunkier appearance, however, I would have used choc chips if there had been a packet in the pantry. Cream (beat) butter, sugars and vanilla essence until light and fluffy. This can be done in a food processor.